This guide is to fix the problem in this scenario. When Yeastar S-Series VoIP PBX is OpenVPN server, as we know, Yeastar S-Series VoIP PBX will allocate a dynamic IP address for OpenVPN client. This guide will guide you how to allocate a fixed IP address for OpenVPN client. 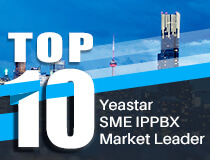 Note: Please make sure your Yeastar S-Series VoIP PBX firmware version is higher than 30.4.0.25. There are 3 kinds verification mode for Yeastar S-Series VoIP PBX OpenVPN. For this guide, we can divide it into 2 modes. One is the verification mode with 'Account’, the other is the verification mode without ‘Account’. Below figure I marked with red are the verification mode with ‘Account’, the other one is without ‘Account’. If you chose the verification mode without ‘account’, please refer the following paragraphs. Step 1. Open the OpenVPN configuration file, find the client certificate file ‘client.crt’, double click the ‘client.crt’. Then it will pop-up a window, Certificate->Details->Issuer-->CN. Copy the ‘CN’value. In this example the CN value is ‘ElastixVPN’. Step 2. Go to Yeastar S-Series VoIP PBX web interface, in menu VPN Server->Static IP, paste the CN value in the right field, and assign a fixed ip for the OpenVPN client. If you chose the verification mode with ‘account’, please refer the following paragraph. Step1. Go to Yeastar S-Series VoIP PBX web interface, in menu VPN Server->Account, create an account. Step 2. Then go to the menu VPN Server->Static IP, select the account you created in step 1. Then allocate a fixed ip address for the OpenVPN client. Hello, I followed the instructions mentioned in VPN_Server_Configuration_Guide_en.pdf step by step, but the connection was not made. after creating the certificates and setup the central, the resource monitor shows the server connected and the client disconnected. What could be the problem? ?